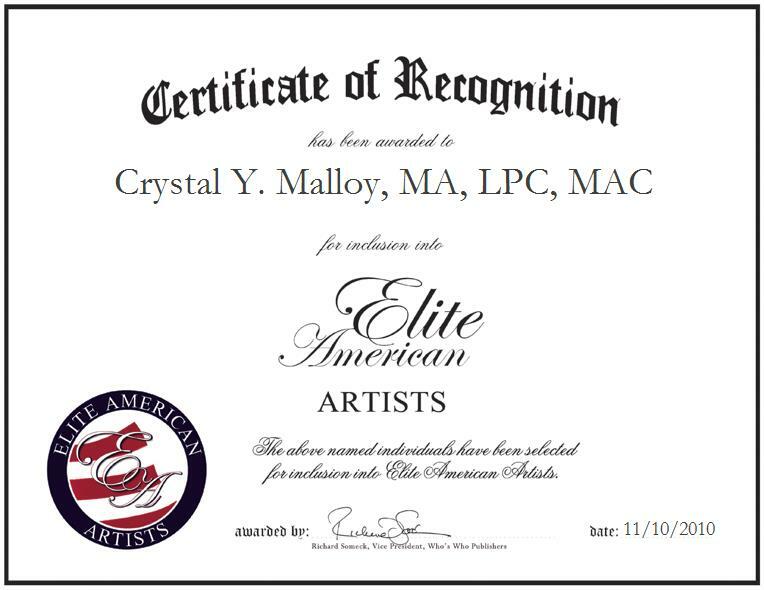 Hampton, Virginia | November 10, 2010 | Crystal Y. Malloy, MA, LPC, MAC, Artist with Warrior Status, Inc., has been recognized by Elite American Artists for her dedication and expertise in oil painting. As an artist, Ms. Malloy creates artwork, presents arts for auctions and exhibitions, and creates marketing for e-Bay, Inc. Attributing her success to her patience and allowing herself space for creativity to flourish, Ms. Malloy also lends her services and skills to wounded soldiers and military families overseas in Landstuhl, Germany and frequently donates artwork to raise funds for the Fisher House Foundation in Landstuhl, Germany. A product of a military family herself, she enjoys the opportunity to help other military families through life’s transitions, stresses and challenges. Ms. Malloy has also seen vast success as an artist; including having her artwork displayed in an art exhibition in Heidelberg, Germany in 2006. Dedicated to achieving success in both her art and her work with Fisher House, Ms. Malloy advises to never lose sight of what it is that you want to do. Art is important to Ms. Malloy; she suggests that one should not be swayed and lose sight of their artistic goals, in the end it is not about producing something that is pretty or perfect, but something that is true to one’s love of art and personal creativity. Ms. Malloy earned a master’s degree in counseling from Hampton University plus 30 additional credits, from University of Oklahoma. She holds certifications as a Licensed Professional Counselor from the State of Virginia, a Master Addiction Counselor and a Criminal Justice Specialist from the National Association of Forensic Counselors. She retains affiliations with the American Psychological Association and volunteers with various local charitable organizations, including Families of Injured Soldiers and Assistance for Children with Emotional and Psychological Disabilities. Ms. Malloy has received various honors and awards for her dedication to helping others, including a Cash Performance Award (1996-2000) and Sustained Superior Performance Award (1999) from the Adolescent Substance Abuse Counseling Service of the Science Applications International Corporation in Europe, Outstanding Young Women Award in 1991-1994, Outstanding Student Award from Arizona State University in 1985, and a Kappa Alpha Psi Fraternity Scholarship in 1982. The Fisher House Foundation is a unique private-public partnership that offers programs to support America’s military in their time of need. For more information about the Fisher House Foundation, please visit their website at http://www.fisherhouse.org. For more information about Crystal Malloy, please visit http://crystalmalloy.com.